Top-quality roofing membranes, resistant to extreme weather conditions and effectively wicking, are a decisive factor for the proper execution of each roof. By using the most advanced methods of production, Himalayan ROOF® roofing membranes are characterized by a high, uniform vapor permeability, water resistance, high resistance to UV radiation, as well as the ease of laying and high mechanical strength. According to the law regulations of each contry, the owners of buildings and landlords are obliged to ensure the safety of people in the vicinity. Protection against sliding masses of snow from the roof, can provide ladders, snow stoppers and snow breakers. 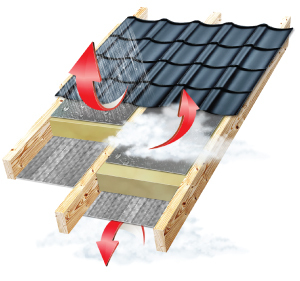 Mounting of snow protection elements on the roof varies depending on the so-called snow zone in which there is a building. Spacing of snow ladder brackets should not exceed 60 cm for zones 1, 2 and 3 and 40 cm for zones 4 and 5. In the case of buildings located above 1000 m asl in all zones spacing must not exceed 40 cm. In addition, on roofs with a slope greater than 40 ° and with roof surface length over 8 meters there should be installed at least two rows snow breakers. An alternative method of protection is to mount snow stoppers on the entire roof. - It is recommended to mechanically fix minimum every fourth tile in wind zone 1, every third in wind zone 2, and every second tile in zone 3. - On roofs with a slope greater than 55 ° each tile should be fixed. Regardless of fixing tiles on the slope, you should attach all the extreme tiles, eaves, ridge, as well as around chimneys and skylights and roof valleys.